“Tomorrowland and Tomorrowland and Tomorrowland…It is a tale told by an imagineer, full of sound and fury, signifying nothing.” Sorry, William Shakespeare, couldn’t resist the appropriation. Brad Bird is an enormously talented filmmaker as he proved with The Iron Giant, The Incredibles, Ratatouille, and even Mission Impossible: Ghost Protocol. But his gifts fail him with his latest, a libertarian fantasy of a better world that only the best and the brightest can access and where they will be free to perfect the future. 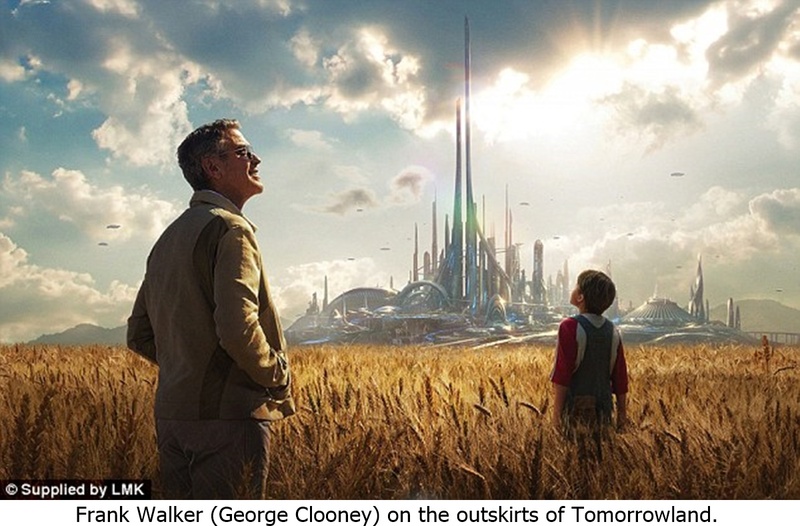 The problem isn’t that Tomorrowland is a libertarian fantasy—although that is problematic—it is that there is precious little wonder to be had in a silly saga inspired by the Disneyland attraction in which a teenage girl’s optimism is the one thing that might prevent apocalypse. Britt Robertson (Under the Dome, Cake) has the thankless task of playing the gee-whiz kid herself, Casey, the daughter of a NASA engineer, who spends most of the movie in constant amazement, her eyes so wide it’s a miracle that her eyeballs don’t pop out. Counterbalancing Casey’s sunny disposition is sour Frank Walker (a gruff George Clooney), one-time boy genius turned embittered recluse. Athena (Raffey Cassidy), an old friend of Frank’s, puts them together. Casey’s had a glimpse of Tomorrowland and is eager to visit. Frank spent part of his childhood there, but his sense of wonder is long gone. Athena knows the sands of time are running out for the world and senses that Casey is the key to reversing the situation—but only if she and Frank can make it to Tomorrowland. Naturally, there are forces determined to keep Casey and Frank from making their way to this eden. Nix (Hugh Laurie), who runs things in this sleek, futuristic world, doesn’t even want the ne plus ultra of humanity darkening Tomorrowland’s doors, since even the elite aren’t immune to humanity’s self-destructive pathologies. Not that he’s one talk, based on how he defends his realm. For a Disney movie, there are a lot of explosions.